There is a hole at my home course in the Pittsburgh area, No. 8, a par 4 that doglegs to the right and features a couple of trees that stick out on the corner like a defiant goalpost. It’s a long-ish hole and easily the toughest par on the front nine. My son, Mike, a big hitter who played in the U.S. Open this summer, has no problem cutting the corner here even from the tips. Not me. My left knee has turned to crap from surgery and severe arthritis and I have moved up to the white tees. The dreaded eighth hole is no bargain from there, either, and I teed up a Knuth Golf High Heat 3-wood there a few weeks ago, and launched one well. The ball flew between and well above those imaginary goalposts and bounced down the fairway into wedge range. Mike looked at me, I looked at him. We had did-that-just-really-happen expressions on our faces. “Let me hit another one,” I said. Honestly, I blocked that first drive 20 yards right. I had no intention of cutting the corner nor any belief that I could. The second ball was an instant replay. The High Heat 3-wood launched hot and high and long. The second shot finished in the fairway ten feet from the first. “I haven’t seen you hit a 3-wood like that in years,” Mike said, His comment reminded me that in the modern high-tech age of metal woods, I haven’t had a 3-wood I loved since the early Adams Tight Lies days. Gee, that’s almost 20 years ago. The fact that the High Heat 3-wood is the only club in my bag that I have confidence in now should tell you something. Pardon me for sulking in an I-hate-my-game moment but if I can pound the High Heat 3-wood while effectively whiffing everything else in the bag, it must be pretty good. 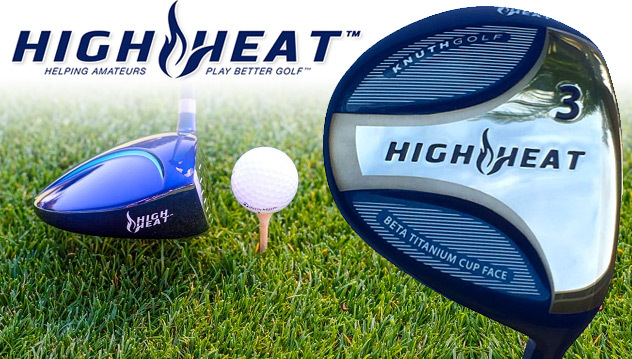 The High Heat 3-wood has a long, low profile. It gives me the mental image of a rear fender from a 1958 Corvette. It is painted a glowing blue. I like the look, I love the result. When you make decent contact with the High Heat, the ball jumps off the face so easily, you almost don’t even feel it, which reminds of how it felt when I hit the occasional home run a million years ago, when I played baseball. I wrote about the High Heat 3-wood from last year’s PGA Merchandise Show in Orlando, where I hit a prototype at Demo Day, and named it the “best” fairway wood at the Show. Dean Knuth, the club’s inventor, made the best even better with a few improvements after that before starting the manufacturing process. The High Heat 3-wood is as easy to hit high as a 5-wood but it has the power and length of a 2-wood (if you’re old enough to remember persimmon 2-woods, or brassies – I had one, a nice hand-me-down). Here’s what makes the 3-wood so remarkable. Knuth, a former Navy man who later worked for the United States Golf Association and invented the SLOPE rating system, created the High Heat 3-wood (along with the also highly rated High Heat Driver and High Heat Hybrid) without the resources of the big equipment makers. The 3-wood I replaced in my bag with the High Heat was produced by one of golf’s biggest companies and I was never very enthused about the club. How was Knuth able to do something the big boys couldn’t? “The major brands get tour pros playing their clubs so they can advertise but they’re trapped making clubs for them and not amateurs who have much slower swing speeds and different performance needs,” Knuth said. So what do amateur golfers need to achieve their optimum performance? A deep and low center of gravity (CG) also raises the moment of inertia (MOI), Knuth said, and makes the High Heat clubhead more stable. That also adds to the gear effect, which means that shots hit off High Heat’s toe or the heel will tend to come back toward the target line compared to major brands. High Heat clubs are available online at www.knuthgolf.com ($299) for the 3-wood. They’re also being sold at The Villages, the retirement area in Florida where Knuth said they’re having success by attending demo days that feature at least one major manufacturer. My High Heat 3-wood analysis in a nutshell: I’m a believer. Editor: When ordering at www.knuthgolf.com mention Golf Oklahoma for additional savings; $70 on driver, $30 on fairway woods and $20 on hybrids.